The September issue (Volume 1, Issue 9) of “the Midlands’ No. 1 magazine about fashion, beauty, and lifestyle” JOLIE recently hit the newsstands with images taken during the 80808 on 80808 show. 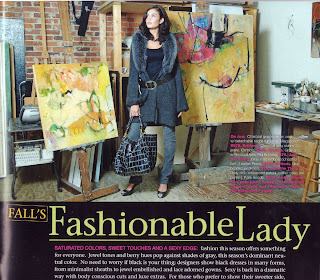 Jolie’s art director is Ja’maal Mosely. The fashion editor is Lisa Arnold. The photographer for this article is Elaine Floyd. 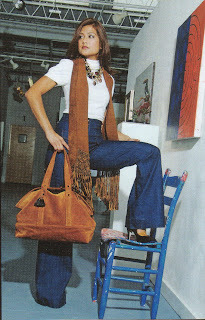 Above: Ava Hart models fashions between Laura Spong’s Unmeasured Current (left) and Waiting to Feed the Butterflies (right). Ava Hart models in front of former Vista Studios artist Jeanette Grassi’s rural urban (left) and type aeiou (right). 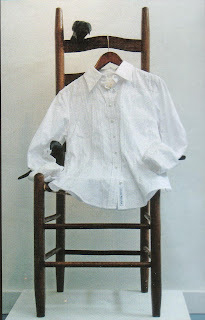 Pat Gilmartin’s Eight by Eight Eyes provided perfect site/sight for this white shirt from Exotica. Misaela Alquicira models in front of Ethel Brody’s Eight Plus One.